Alex Busher at Edmiston sends news of an Open Day on his central listing, the 47.5m motor yacht Ellix Too this Friday, July 29th, between 3pm and 7pm at the Quai des Etats Unis in Monaco. 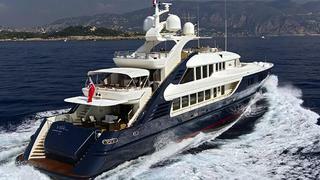 Ellix Too was built by ISA to a design by Walter Franchini for her present owner and delivered in 2005. She has recently completed a major refit including a complete repaint of her topsides in flag blue, superstructure in oyster white, new generators and more. Lloyds classed and MCA compliant for charter accommodating 12 guests, Ellix Too is ready for her new owner for immediate cruising, asking €14.95 million.